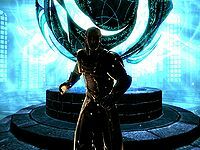 Ancano is an Altmer elemental mage and an agent of the Thalmor. He resides at the College of Winterhold, where he serves as an "advisor" to the Arch-Mage. The College community demonstrates a palpable mistrust toward him due to his Thalmor allegiance. 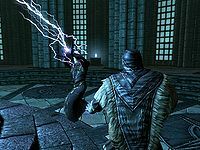 As the College quest line unfolds, it becomes increasingly clear that Ancano is involved in a sinister plot on behalf of the Thalmor; and that the discovery of a strange orb underneath Saarthal is key to some ominous scheme. 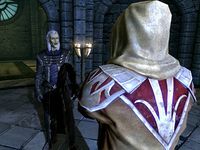 While he claims to be the Thalmor advisor for Arch-Mage Savos Aren, Ancano seems to show up everywhere except consulting to the Arch-Mage. He spends all of his time inside the Hall of the Elements, carefully listening to everything that is going on. When he is not busy with his many quest-related actions, he sleeps in his room on the ground floor of the Hall of Attainment between midnight and 4am. 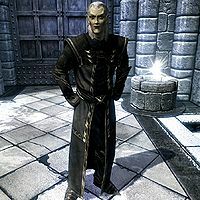 He wears Thalmor robes with matching boots and gloves. He knows a huge number of spells. From the school of Destruction he knows Chain Lightning, Fireball, Firebolt, Incinerate, and Thunderbolt. From the school of Restoration he knows Close Wounds, Fast Healing, Grand Healing, Greater Ward, and Steadfast Ward. Lastly, he knows the Conjure Frost Atronach spell. He is unpleasant and patronizing and will greet you with a threat: "Another new Apprentice, I see. Are you of the sort that believe you're here to change the world? Or are you only in it for yourself? I assure you that I shall be watching you -- all of you -- very closely." At all other times, he will look at you in disgust and say: "I have many important things on my mind. Your concerns are not among them. ", "Are you quite sure we need to be speaking? ", "I'm disappointed to say I've learned little during my time here. ", and "I had hoped your scholars would be on a level comparable with my own colleagues. They are not." He will, however, answer a few basic questions. On the Thalmor, he will say: "Now that stability has been established between the Dominion and the Empire, we seek only to help Skyrim. To guide its people through this time of transition, to help lead them to a better future." When asked exactly what he is doing in the College he will respond: "I am an advisor to the Arch-Mage. The Thalmor wish to promote relations with your College. I am at the Arch-Mage's disposal if he requires advice." You can then ask if the Arch-Mage often asks for advice: "Perhaps not as often as he should. In time, I believe he will be more trusting." "The Arch-Mage has my thanks." If approached, Ancano will then address you directly about the event: "Your superior and I were simply having a... discussion about my level of access to the College." If you claim it sounded like an argument he will return to his patronizing self: "Well, perhaps that is why you're merely an Apprentice here." When asked if there is a problem he will brush you off: "Nothing you need to concern yourself with. I shall be quite capable of observing everything that goes on here." Brelyna Maryon: "I know I don't like the way he looks at me. I can't tell if he expects me to blow myself up, or to try and murder him. But he clearly doesn't trust any of us." 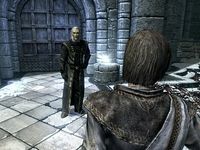 Onmund: "I know he's from the Thalmor, and that he claims to be here simply as an advisor. I also know that no one really believes that. I've been trying to avoid him, honestly." Arniel Gane: "He's asked far, far too many questions about my research. I think the Thalmor are trying to steal my work! I haven't told him anything, of course. What I'm doing is far too important. Can't breathe a word of it." Nirya: "Don't trust that one. He's up to something. Most here are up to something, of course, but in his case, it's not good. I haven't figured it out yet, but I will. He is rather handsome though, isn't he?" Mirabelle: "Well then 'observe' from a greater distance. You're making people uncomfortable." "You there. I have questions for you." After you return from Saarthal and report to Savos Aren about the strange Orb, thus starting the quest Hitting the Books, Faralda will seek you out to issue a warning about Ancano: "There you are. I've been trying to find you. I just wanted to let you know that Ancano's been asking about you. I think he's looking for you." When you ask why Ancano would be looking for you, she will say: "I'm not sure. Just... Well, mind what you tell him, all right?" When you ask her to elaborate she will take you further into her confidence: "Between the two of us, there are rumors about him. That this 'advisor' position he has is a sham, an excuse. That what he's really doing is spying for the Thalmor, trying to feed them information. Whether it's true, I can't say." After this warning, you can confront Ancano with the rumors floating through the College: "What? Preposterous, and just the sort of thing I would expect from mages who have nothing better to do with their time. I have made it quite clear that my only role here is as an advisor to the Arch-Mage. I would suggest that you not further spread this rumor." Regardless of what happens, Faralda will prove to have been right when she told you she thought Ancano was looking for you: As soon as you have talked to Urag gro-Shub about the missing books, Ancano will suddenly appear right behind you in the Arcanaeum and start interrogating you about Saarthal: "You there. I have questions for you. You were in Saarthal, yes? It has come to my attention that something was found there." You have two options; you can say "maybe...", which will slightly irritate him: "I know full well that you have. Please do not insult my intelligence. Tolfdir is still there now, is he? I shall expect a full report when he returns." You can also just inform him that something was found in Saarthal: "I am well aware. Tolfdir is still in Saarthal, is he? I shall be expecting a full report from him when he returns." If asked how he even knows, he'll reply: "It is my job to know these things. My role as advisor to the Arch-Mage is aided by knowing everything that transpires here." 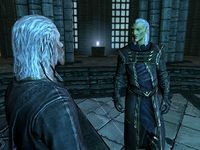 If you ask him why he takes such an interest, he'll explain: "Something was discovered in Saarthal that was significant enough that Tolfdir sent a new member of the College, alone, to deliver word. That sounds precisely like the sort of thing that should matter to everyone. Especially me. Thank you for your help. You may go now." He'll then leave you alone to take care of the rest of Hitting the Books. "I'm afraid I must intrude." Ancano: "I'm afraid I must intrude. It is urgent that I speak with your associate immediately." Tolfdir: "Now, I... This is most inappropriate! We are involved in serious research here!" Ancano: "Yes, I've no doubt of its gravity. This, however, is a matter that cannot wait." Tolfdir: "Well, I'm quite sure I've never been interrupted like this before... the audacity!... I suppose we'll continue this at some later time, when we can avoid interruptions." While Tolfdir walks away, Ancano turns to you: "I need you to come with me immediately. Let's go." You can then tell him you don't understand what's going on: "Really? Well, allow me to clarify the situation. I'd like to know why there's someone claiming to be from the Psijic Order here in the College. More importantly, I'd like to know why he's asking for you specifically. So we're going to go have a little chat with him, and find out exactly what it is he wants." You can then point out he is just an adviser, and he'll admit: "Technically, that is true. But I still report to the Aldmeri Dominion, and I cannot ignore this situation. Don't worry, you can return to your petty squabbles and meaningless 'research' as soon as this matter is resolved." Or you can ask why he is so concerned about a visitor from the Psijic Order, he'll tell you: "I'll be the one asking the questions. All you need to know is that the Psijic Order is a rogue organization, believing themselves to be above the law. They have clashed with the Aldmeri Dominion before, and I have no intention of allowing that to happen here." He then turns around and you will have no choice but to follow him towards the Arch-Mage's Quarters. On the way, he will instruct you: "Now, you are going to speak to this... Monk... and find out why he is here, and then he will be removed from College grounds." You can ask him exactly what you are supposed to say to the monk, and he will repeat: "Find out why he's here, and what he wants." "What? What trickery is this?" Ancano: "Well? What is the meaning of this?" Quaranir: "I'm sorry, I'm afraid I don't understand." Ancano: "Don't play coy. You asked to see a specific member of the College. Here he/she is. Now what is it that you want?" Quaranir: "There's been a misunderstanding. Clearly I should not be here. I shall simply take my leave." Ancano: "What? What trickery is this? You're not going anywhere until I find out what you're up to!" Quaranir: "I am not 'up to' anything. I apologize if I have offended in any way." Ancano: "We will see about this..."
Quaranir will then leave the College and Ancano will return to the Eye of Magnus. If confronted, he'll state: "I'm not sure what just happened but I assure you I will get to the bottom of it." When you ask him to elaborate he'll continue: "Whatever it is those Psijics are up to. They cannot be trusted. For all we know, he's here to scout out the College. I'm sure they want to undermine our efforts." When asked about what he means by that he'll explain: "This! This... Orb. The Eye of Magnus, whatever you want to call it. It's clearly powerful, and no doubt they want it for themselves! I expect to be informed if they make any future attempts to contact you." Lastly, if you ask him about the Augur of Dunlain, he'll claim not to know him: "The what? No. No, I'm quite sure I have no idea what you're talking about. I suggest you mind your own business and return to whatever it is you do here." When you locate the Augur of Dunlain in The Midden it becomes clear that Ancano lied and knows perfectly well what the Eye of Magnus is all about. When you tell Augur that you were told to find him, he'll point out: "Indeed. And so you have come looking, though you do not know why. Like others before you, you blindly follow a path to your own destruction. The Thalmor came seeking answers as well, unaware they will be his undoing. Your path now follows his, though you will arrive too late." 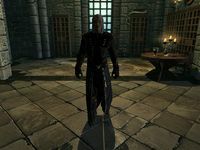 When you ask what Thalmor he means, he'll explain: "The one who calls himself Ancano. He seeks information about the Eye, but what he will find shall be quite different. His path will cross yours in time, but first you must find that which you need." He will also hint at terrible things to come due to the power of the Eye of Magnus: "You seek that which all who wield magic seek. Knowledge. You shall find this: Knowledge will corrupt. It will destroy. It will consume. You seek meaning, shelter in Knowledge. You will not find it. The Thalmor sought the same thing, and it shall lead to his end as it has so many others." When Savos Aren slowly approaches the possessed Thalmor, a sudden explosion from the Eye will turn everything white and knock you out. When you come to your senses, you will find Mirabelle leaned against a wall, seemingly hurt by the explosion. She will explain what happened: "Ancano is doing something with that thing... the Eye. We can't stop him! I haven't seen Savos since the explosion. He must've been blown clear, and he may be injured. I need you to find the Arch-Mage, and I need you to do it quickly. Get moving!" Ancano will now be completely immersed in some kind of magical field crackling about the Eye, and you can catch only glimpses of him through this. "Bring back that staff before Ancano brings the whole College down around us." When you head outside, you will find that Ancano and the Eye claimed a victim: the Arch-Mage will be lying dead outside, surrounded by shaken College members. When Tolfdir sees you, he will seek you out and ask what happened in there. If you tell him that Ancano did something with the Eye of Magnus, he'll be surprised: "Is he responsible for this? The Arch-Mage, dead? There's more. Something's happened to Winterhold. It must be whatever Ancano did. You need to get out there and make sure it's safe. Quickly now, quickly! I'll find Mirabelle and see if we can't put a stop to this!" Once you have killed all the magic anomalies in Winterhold as part of the quest Containment, Mirabelle will be waiting for you in the Hall of the Elements, still helpless against the huge ward surrounding Ancano and the Eye of Magnus. When you assure her Winterhold is safe, she will remark: "Wish I could say the same for us. Tolfdir and I can try and keep this contained. You need to get your hands on the Staff of Magnus. Now." If you ask 'Why me? ', she'll point out: "I've got to stay here, to see if we can get to Ancano and stop this. I need someone I can trust to do it. Besides, you're the one having all of these visions, aren't you?" Asked if she thinks the staff will help, she'll remind you: "You were told to find it, weren't you? If the stories about the staff are true, if it really can absorb a tremendous amount of power, maybe we can break through Ancano's magic." She will then tell you to be on your way to Labyrinthian: "Bring back that staff before Ancano brings the whole College down around us." After you have defeated Morokei in Labyrinthian and claimed the Staff of Magnus another Thalmor will appear, just before you exit the ruin. His name is Estormo, and he's clearly sent by Ancano to stop you: "So, you made it out of there alive. Ancano was right... you are dangerous. I'm afraid I'll have to take that Staff from you now. Ancano wants it kept safe... oh, and he wants you dead. Nothing personal." You will have no choice but to kill him with the knowledge that the Staff of Magnus may actually be useful against Ancano. "I am beyond your pathetic attempts at magic." When you return from Labyrinthian with The Staff of Magnus, the entire College will be covered by the strange ward spell from the Eye. Tolfdir will meet you on the bridge with the sad news that Ancano's actions have claimed a second victim, Mirabelle Ervine who died attempting to foil Ancano's catastrophic scheme. When asked what he is doing on the bridge, he will ask you to look at the magically sealed College: "Look for yourself. Ancano's power is growing. We can't crack whatever magic he's using to shield himself. I hope your trip to Labyrinthian was worth it." When you have used the Staff of Magnus to break down the barrier, Ancano will shout: "You've come for me, have you?, You think I don't know what you're up to? You think I can't destroy you? The power to unmake the world at my fingertips, and you think you can do anything about it?" When Tolfdir casts a spell on him that shows no effect, he'll proclaim: "I am beyond your pathetic attempts at magic. You cannot touch me." Tolfdir will tell you to use the staff on the Eye, after which Ancano will exclaim: "Enough!". Then he'll paralyze the Master Wizard and continue: "Still you persist? Very well. Come then. See what I can do now." With this the Eye will open up to release its full power. Ancano will attack you and you will have to use the staff to remove the source of his power by shutting down the Eye. Ancano will defy you throughout the battle: "You dare approach me here? Are you mad? You cannot hope to defeat me! ", "You dare challenge me? ", "No! You will not deny me this! ", "No! The Eye is mine! ", and "You cannot take this away from me!". He'll also taunt you by saying things like "I cannot be defeated! ", "I will end you! ", "Die, insect! ", "My power is supreme! ", and "Die, worm!". If you try to hide from him, he'll exclaim, "Now you die!" or "You cannot escape!" As his health depletes, Ancano will desperately yell, "Noooo...."
After you finish Ancano, Tolfdir will awaken and seek you out. When asked what to do now, he will stutter: "I... I don't know. Ancano is gone, but whatever he's done to the Eye doesn't seem to have stopped. I have no idea what to do!" Fortunately, the Psijic Order and Quaranir will show up, this time remaining on the same plane of time as you and Tolfdir. He will promote you to Arch-Mage of the College, or at least recognize you as such: "We knew you would succeed. Your victory here justifies our belief in you. You have proven yourself more than worthy to guide the College of Winterhold." But he'll also warn: "The Eye has grown unstable. It cannot remain here, or else it may destroy your College and this world. It must be secured. Ancano's actions prove that the world is not ready for such a thing. We shall safeguard it... for now. You now have the opportunity to maintain your College, and carry on with your lives. You have our gratitude, Arch-Mage." 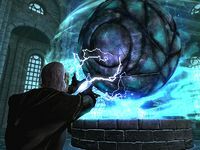 The Psijic Order will then remove the Eye of Magnus from the Hall of the Elements, effectively ending the College of Winterhold quest line. 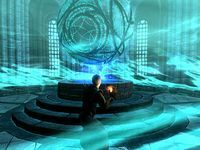 After these events, the College members will return to their usual routines, although some will continue occasionally to mention the Thalmor advisor and your intervention. They will also speculate on what might have been. Nirya will say: "Ancano is exactly why we're so restrictive about access to the College. We'd all have perished if it weren't for you." Phinis Gestor will add: "Nasty business with that Ancano fellow. Pity that I was unable to assist, but I was... otherwise occupied." Lastly, Drevis Neloren will rightfully reflect on what would have happened if the Eye of Magnus were never misused: "The Eye of Magnus. Here, but lost. Slipped through our grasp. Oh, what we might have learned." and "I wonder what we could've done with the Eye, had it been put to better use?" Ancano is voiced by musician Alexander Brandon (IMDb). Ancano also appears in Legends. Ancano won't become hostile if you hit him even though he will show up on the compass as an enemy upon being hit. You will not be kicked out of the college if you attack him. Arrows pass straight through Ancano's head as if it weren't there. Unlike shots to any other part of his body, head shots do not inflict damage. This page was last modified on 23 October 2018, at 00:21.